Nintendogs Lab & Friends is an animal simulation where you can raise one or more adorable puppies and play with them to your heart's content. Teach your pups new tricks. Just speak into the system's microphone and they'll respond to the voice commands you've taught them, then use the DS touch screen to play with your puppy. Breeds available in the game include Labrador retriever, miniature schnauzer, toy poodle, Pembroke Welsh corgi, miniature pinscher and shiba inu. 6 pups to love and care for. View larger. 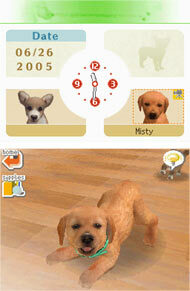 Gameplay In Nintendogs Lab & Friends owners purchase one of the six breeds available at the beginning of Nintendogs, then start spending time with their pups. They throw flying discs and balls to improve the pup’s agility, bathe it when it gets dirty and repeat voice commands to train the dog to do tricks. If owners train it well enough, they will excel in obedience and agility trials and disc competitions, which will earn money that they can use to buy other supplies and puppy breeds. When owners earn enough cash, they can buy even more puppies to live with their original pup. 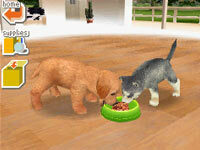 Key Game Features Visit the kennel and select a puppy from some of the most popular breeds, including Labs, Chihuahuas, dachshunds and more, then care for and train the puppy using the touch screen and microphone. 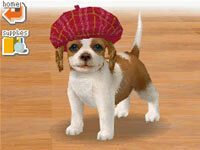 Pet the pup, acquire and play with more than 100 items like tennis balls, flying discs and even clothing accessories. Owners teach their dogs to do tricks by creating their own personalized voice commands. Owners who train their pups well can compete in obedience and agility trials. They win these competitions to earn cash, which they can use to buy supplies and even more dogs to keep their first puppy company. Owners can set the DS to Bark Mode, then take it with them as they head out into the real world. The DS will bark to let them know when another Nintendogs owner is in range and ready to meet. Feed your pup. View larger. bathe and care for him. View larger. Win cash for in-game gear. View larger. Make a connection. View larger. When I first got Nintendogs last Christmas, I expected myself to do as normal; love it for the first month or two, and then set it down. However, this game was not the case.Adopting Your New PetI was.. extatic for my first pet. I believe you start out with $1,000 dollars, enough to buy a $600 pet and starter supplies. For me, I adopted a Shiba, gave it a red collar, and wah la! My real life puppy in my hands. Of course you start out with the dogs ..